Multiple languages are critical to participating effectively in global political, social, cultural, and economic arenas; and the demand for employees to be fluent in more than one language is increasing rapidly in California and throughout the world. As a result, the California Department of Education established the Seal of Biliteracy in 2012 to formally recognize biliteracy as an asset for graduating high school seniors by certifying a high level of proficiency in listening, speaking, reading, and writing in at least 2 languages, one of which is English. 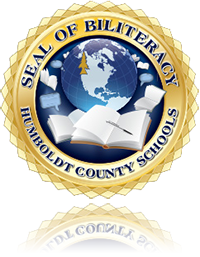 The Seal of Biliteracy is added to graduates’ diplomas as a statement of accomplishment for college admissions and future employers. In addition to meeting stringent criteria in the English language, students demonstrate a high level of second and third language proficiency through coursework, exams, applications, interviews, or other assessments as dictated by each school district. Click here to watch a short, informative video on this unique opportunity! An awards ceremony is held to honor the students’ achievements by presenting them with special medals and certificates.